Donovan Mitchell and Joe Ingles's brilliance will highlight Utah's success, but Rudy Gobert and the Jazz's stifling defense are a key reason for the team's 3-1 series lead over the Thunder. 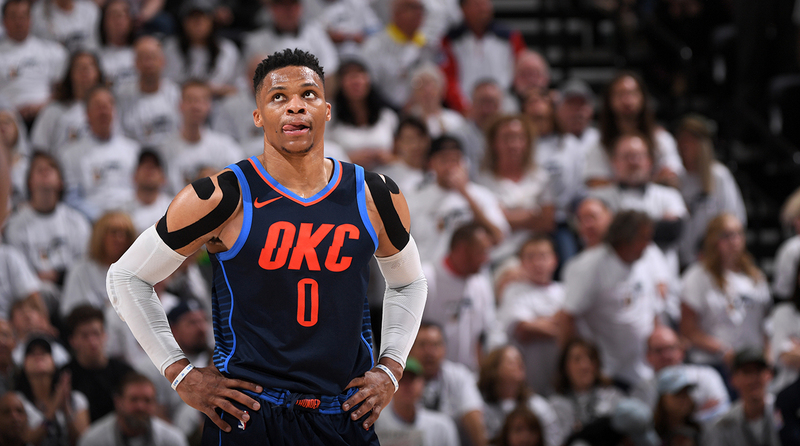 After a memorable summer, the Thunder are in extreme danger of suffering their second straight unceremonious exit from the playoffs. The Jazz absolutely took it to OKC on Monday night, holding homecourt in 113–96 win to take a 3–1 lead in their first-round series. Thanks in large part to stifling defense—and an incredibly balanced offense—the Jazz appear on the verge of a second-round breakthrough. Game 4 was a contrast in styles. All five Jazz starters scored in double figures, as the ball whipped around the perimeter and Utah poked and prodded the OKC defense. Donovan Mitchell led the way with 33 points, but everyone in the starting unit made important contributions. The Thunder, meanwhile, floundered as they tried to put the ball in the basket. Oklahoma City entered Game 4 already scoring nearly four points per 100 possessions less than it did during the regular season. The Thunder played even worse Monday, and Rudy Gobert is the most obvious factor for OKC’s struggles. The Stifle Tower is living up to his nickname, stopping Thunder penetrators from attempting shots within the paint. The Thunder haven’t quite figured out how to operate down low when Gobert is in the game, often forcing bad shots or being forced to reset the offense as the shot clock dwindles down. Yes, the Jazz’s perimeter defenders are doing a good job of getting under the skin of the Thunder’s stars. But nothing has to be more frustrating than beating your man only to see Gobert waiting in front of the rim. OKC can hardly find any easy shots, and the presence of Gobert in the paint alone significantly changes what the Thunder can do offensively. OKC was forced to try to win Game 4 from the perimeter, and the shooting was nowhere near good enough. Carmelo Anthony, Russell Westbrook and Paul George combined to shoot 2-for-18 from three. Anthony was particularly bad, missing open look after open look. If Melo isn’t hitting open catch-and-shoots, what utility does he have on the court? Anthony entered Monday shooting a disappointing 28.6% on catch-and-shoot threes, and that number obviously dropped after he missed all six of his shots from downtown in Game 4. The Thunder start to resemble a contender when George is at the top of his game, but when the paint is cut off and PG-13 can’t hit his threes, the team quickly becomes pedestrian. Westbrook, for all his bluster about slowing down Ricky Rubio, was classically inefficient (23 PTS on 7-18 FG) shooting the ball, though he at least clawed his way to the free-throw line, hitting nine of 11 shots. If there’s one silver lining for the Thunder, it’s that they almost definitely can’t shoot as poorly as they did in Game 4 for the rest of the series. But even OKC catching fire from outside won’t guarantee a victory. The Jazz, despite losing an All-Star instead of gaining two over the summer, simply look like the better collection of talent. Utah is balanced, while the Thunder are still struggling to find a five-man group that doesn’t have an obvious weakness (or two). Joe Ingles and Jae Crowder are providing tough defense on the wing, Mitchell is scoring well beyond his years, and Gobert is playing like the best defender in the world. (Ingles is also hitting threes and stirring, uh, stuff up every chance he gets.) Utah was elite with Gobert on the court this season, and the first four games of this series are perhaps proof that the Jazz’s second-half surge was far from a fluke. Utah’s top-flight defense and well-balanced offense are a problem for any opponent, but their strengths are being highlighted by a Thunder team with a season-long penchant for inconsistency.